34d 25/01/2019 ROCKHAMPTON: Margin 0.2 Distance 1050m SOT G RST CL1 Race 2019 Racing Gala Ball 23/3-C1 Prize $16,500 API 1.2 Race Time 1:00.29 Time Adj +1.52 Sec Time 0:33.76 Sec Time Adj +0.62 Jockey Rick Mcmahon Weight 59.0 CD 59.0 BP 5 Odds 9-2 - 6-1 Trainer Glenda Bell OHR: 53 Ongoing Winners [o] 01-03-10 Rail True. Track Direction Clockwise Winner All Pickled (57) Third Free Drop (56) Inrunning Position third on settling, third at 800m, third on turn Tempo Suited front runners Video Comment Jumped on terms, settled on-pace 3WNC 2L, 2WWC on-pace 1L at the turn, shifted out at the 400m and ran on, took lead at the 200m, pipped on the post. 28d 22/12/2018 MACKAY: Margin 1.9 Distance 1100m SOT G RST CL1 Race Smartstate Vehicle Rentals-C1 Prize $14,500 Race Time 1:04.37 Time Adj +2.27 Sec Time 0:35.45 Sec Time Adj +2.11 Jockey Mark Barnham Weight 57.0 CD 57.0 BP 10 Odds 25-1 - 30-1 Trainer Glenda Bell OHR: 53 Ongoing Winners [o] 00-03-13 Rail True Entire Course. (Pent: 4.6). Track Direction Clockwise Gear Change Blinkers FIRST TIME Stewards Raced wide for the majority of the race. Winner L'amour Malade (56.5) Second Lady Mirabella (54.5) Third Bebado (59) Inrunning Position twelfth on settling, twelfth at 800m, eleventh on turn Tempo Suited back makers Video Comment Jumped fairly, settled worse than midfield 3WWC 5L, 5+WNC worse than midfield 4.25L at the turn, pulled widest, ran on well without threatening. 11d 16/03/2019 ROCKHAMPTON: Margin 4.5 Distance 1200m SOT G RST CL1 Race Griffin Builders Hcp (C1) Prize $16,500 API 0.28 Race Time 1:11.40 Time Adj +3.17 Sec Time 0:34.74 Sec Time Adj +0.74 Jockey David Simmons Weight 57.5 CD 57.5 BP 9 Odds 15-4 - 11-2 Trainer Olivia Cairns OHR: 48 Ongoing Winners [o] 04-04-14 Rail Out 7.5m Entire Course. Track Direction Clockwise Stewards Raced three wide without cover throughout. Slightly hampered passing the 400m when awkwardly placed at the heels of Lady Bec. Winner Quidni (58.5) Second Whoosh (58) Third Tom's Star (52.5) Inrunning Position ninth on settling, ninth at 800m, ninth on turn Tempo Suited front runners Video Comment Jumped fairly, settled worse than midfield 3WWC 6+L, 4WWC worse than midfield 6L at the turn, slightly hampered passing the 400m. 8m17d 23/02/2019 MACKAY: Margin 2.9 Distance 1050m SOT G RST CL2 Race Kombi Keg Whitsunday Plate-C2 Prize $19,000 API 0.13 Race Time 1:01.85 Time Adj +2.21 Sec Time 0:34.11 Sec Time Adj +0.79 Jockey David Hayse Weight 57.5 CD 57.5 BP 5 Odds 8-1 - 15-1 Trainer Olivia Cairns OHR: 50 Ongoing Winners [o] 01-03-10 Rail Out 4m Entire Course. (Pent: 4.7). Track Direction Clockwise Gear Change Bandages OFF FIRST TIME, Tongue Tie FIRST TIME Winner Cosmological (59) Second Grazie Mille Bella (55.5) Inrunning Position seventh on settling, seventh at 800m, sixth on turn Tempo Suited front runners Video Comment Jumped on terms then eased back, settled 2nd last of 8 on the inside 4.5L, 6th 2WWC 5L at the turn. 16d 11/06/2018 CAIRNS: Margin 1.7 Distance 1400m SOT G RST BM55 Race Aon Risk Solutions (BM55) Prize $12,000 API 0.35 Race Time 1:23.47 Time Adj +1.54 Sec Time 0:36.12 Sec Time Adj +0.48 Jockey Ms S Wiseman Weight 56.5 CD 56.5 BP 10 Odds 4-1 9-2 - 15-4 Trainer Trevor Rowe OHR: 50 Ongoing Winners [o] 00-01-15 Rail Out 2m 575m-375m; True Remainder. (Pent: 5.14). Track Direction Clockwise Stewards Shifted wider rounding the home turn to obtain clear running. Winner Arno Bay (59) Second Slam Dunked (57) Third Aesop (54) Inrunning Position ninth on settling, tenth at 800m, twelfth on turn Tempo No bias Video Comment Jumped evenly, 9th on settling, 10th at 800m, 2nd last on the turn 5+WWC 7L, shifted wider rounding the home turn to obtain clear running, made some ground without threatening. 12d 18/10/2018 MACKAY: Margin 5.5 Distance 1200m SOT G RST BM60 Race Dwayne Casey Electrical-Bm60 Prize $14,000 API 1.12 Race Time 1:10.05 Time Adj +1.55 Sec Time 0:34.30 Sec Time Adj +0.78 Jockey David Hayse Weight 57.0 CD 57.0 BP 9 Odds 11-1 - 20-1 Trainer Dennis Durand OHR: 55 Ongoing Winners [o] 02-02-09 Rail True. (Pent: 4.8). Track Direction Clockwise Stewards Raced 3 wide for the majority. Winner Deus (56.5) Second Our Boy Pendles (61.5) Third Chief Advocate (60) Inrunning Position seventh on settling, seventh at 800m, ninth on turn Tempo Suited front runners Video Comment Jumped fairly, settled last of 9 3WWC 5.5L, last 2WWC 3.5L at the turn, plodded home. 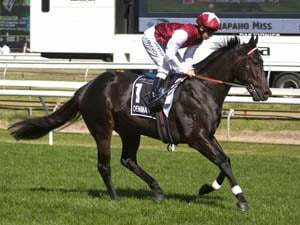 3m8d 6/10/2018 MACKAY: Margin 0.8 Distance 1050m SOT G RST BM55 Race Nexans Olex (BM55) Prize $12,000 Race Time 1:00.93 Time Adj +1.28 Sec Time 0:34.68 Sec Time Adj +1.36 Jockey Andrew Spinks Weight 59.0 CD 57.0 BP 1 Odds 4-1 - 9-2 Trainer Dennis Durand OHR: 56 Ongoing Winners [o] 01-03-12 Rail True Entire Course. (Pent: 4.7). Track Direction Clockwise Winner Chat Time (57.5) Third Ararrac (60) Inrunning Position fourth on settling, fourth at 800m, third on turn Tempo No bias Video Comment Jumped on terms, settled 4th of 9 2WWC 2.25L, 3rd 4WNC 3/4L at the turn, ran on strongly, found one better. 16d 30/06/2018 MACKAY: Margin 6.4 Distance 1560m SOT G RST BM65 Race Prochem Agencies (BM65) Prize $20,000 Race Time 1:35.28 Time Adj +3.08 Sec Time 0:35.83 Sec Time Adj +0.92 Jockey David Hayse Weight 54.5 CD 54.5 BP 1 Odds 11-1 - 12-1 Trainer Dennis Durand OHR: 55 Ongoing Winners [o] 01-02-15 Rail True Entire Course. (Pent: 4.9). 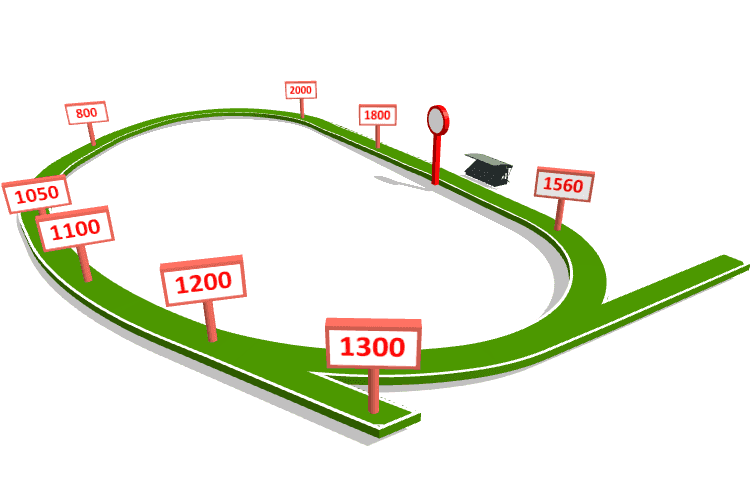 Track Direction Clockwise Stewards Laid out rounding the 1350m turn. Winner Under The Weather (60) Second Heyington (57) Third Broken Finger (57) Inrunning Position fifth on settling, fifth at 1200m, fifth at 800m, fourth on turn Tempo Suited front runners Video Comment Jumped fairly, pushed forward 5th on settling, laid out rounding the 1350m bend, turn 5th at 800m, 4th 4WNC 3/4L on the turn, couldn't go on. 19d 14/06/2018 MACKAY: Margin 0.6 Distance 1300m SOT G RST BM60 Race Kevin's Kitchen (BM60) Prize $14,000 API 0.38 Race Time 1:18.11 Time Adj +3.1 Sec Time 0:36.46 Sec Time Adj +1.97 Jockey David Hayse Weight 57.0 CD 57.0 BP 7 Odds 9-2 - 8-1 Trainer Dennis Durand OHR: 56 Ongoing Winners [o] 01-03-14 Rail Out 3m Entire Course. (Pent: 4.87). Track Direction Clockwise Stewards Raced wide in the early stages. Shifted out to improve leaving the 600m and had a tendency to lay in. Winner Heyington (57.5) Second Hot Tempo (55.5) Inrunning Position sixth on settling, sixth at 800m, sixth on turn Tempo Suited back makers Video Comment Jumped on terms to be 6th 5L on settling, shifted out to improve leaving the 600m and had a tendency to laid in, held position to the turn 5+WNC 1.5L, peeled wider and worked home well from the rear. 13d 29/11/2018 MACKAY: Margin 9.3 Distance 1560m SOT G RST BM60 Race Mcdonald Murphy Machinery-Bm60 Prize $16,500 API 0.63 Race Time 0:00.00 Time Adj +0 Sec Time 0:36.01 Sec Time Adj +2.03 Jockey Christopher Mc Iver Weight 56.0 CD 56.0 BP 4 Odds 20-1 25-1 - 12-1 Trainer Joshua Manzelmann OHR: 52 Ongoing Winners [o] 01-04-09 Rail Out 3m Entire. (Pent: 4.5). Track Direction Clockwise Winner Mustarrid (62) Second Mishnah (59.5) Third Escaday (59.5) Inrunning Position seventh on settling, seventh at 1200m, eighth at 800m, eighth on turn Tempo Suited front runners Video Comment Jumped on terms then eased back, settled 7th of 9 on the inside 4L, last on the inside 6L at the turn, never gave a sight. 10d 16/11/2018 MACKAY: Margin 1.8 Distance 1300m SOT G RST BM55 Race Seven Mackay (BM55) Prize $19,000 Race Time 1:17.55 Time Adj +2.77 Sec Time 0:36.09 Sec Time Adj +2.42 Jockey Dale Evans Weight 59.0 CD 59.0 BP 5 Odds 20-1 - 20-1 Trainer Joshua Manzelmann OHR: 54 Ongoing Winners [o] 00-05-11 Rail 3m Entire Course. (Pent: 4.55). Track Direction Clockwise Stewards Tightened after the start, losing its position. Winner Escaday (60) Second That's Her I Think (56) Third Hyper Drive (55) Inrunning Position tenth on settling, tenth at 800m, tenth on turn Tempo No bias Video Comment Tightened after the start, losing its position, settled last on the inside 6+L, still last 5+WWC 6+L at the turn, chased on steadily from the outside making good ground in the straight but never likely. 20d 18/10/2018 MACKAY: Margin 2.3 Distance 1200m SOT G RST BM60 Race Dwayne Casey Electrical-Bm60 Prize $14,000 API 1.12 Race Time 1:10.05 Time Adj +1.55 Sec Time 0:34.30 Sec Time Adj +0.78 Jockey Dale Evans Weight 57.5 CD 57.5 BP 7 Odds 40-1 - 40-1 Trainer Joshua Manzelmann OHR: 56 Ongoing Winners [o] 02-02-09 Rail True. (Pent: 4.8). Track Direction Clockwise Stewards Hung in when placed under pressure. Winner Deus (56.5) Second Our Boy Pendles (61.5) Third Chief Advocate (60) Inrunning Position eighth on settling, eighth at 800m, eighth on turn Tempo Suited front runners Video Comment Jumped fairly, settled 7th of 9 on the inside 4L, 2nd last on the inside 2.5L at the turn, hung in when placed under pressure, battled on solidly, didn't threaten. 50d 9/11/2018 ROCKHAMPTON: Margin 51.4 Distance 1050m SOT G RST RST60 Race Winstondale Contractors Hcp-60 Prize $19,000 API 0.44 Race Time 1:00.55 Time Adj +1.78 Sec Time 0:33.60 Sec Time Adj +0.46 Jockey David Hayse Weight 54.0 CD 54.0 BP 7 Odds 9-1 - 12-1 Trainer Krystle Johnston OHR: 48 Ongoing Winners [o] 00-02-11 Rail True. Track Direction Clockwise Stewards Stood flatfooted as the start was effected, lost significant ground, taking no competitive part in the event. Winner Deus (58.5) Second Sirius Black (59) Third Golfing (56.5) Inrunning Position tenth on settling, tenth at 800m, tenth on turn Tempo Suited front runners Video Comment Stood flatfooted as the start was effected, lost significant ground, settled last on the inside 6+L, inside last 6+L at the turn, took no competitive part. 7d 20/09/2018 ROCKHAMPTON: Margin 8.5 Distance 1600m SOT G RST CL2 Race Michael Munns Memorial Plte-C2 Prize $14,000 API 0.16 Race Time 1:35.77 Time Adj +1.72 Sec Time 0:35.24 Sec Time Adj +1.73 Jockey Nicole Seymour Weight 57.0 CD 57.0 BP 1 Odds 13-2 11-1 - 10-1 Trainer Krystle Johnston OHR: 50 Ongoing Winners [o] 04-01-08 Rail True Entire. Track Direction Clockwise Winner The Greatest (59) Second Colorado River (57.5) Third Patriotic Rose (55.5) Inrunning Position first on settling, first at 1200m, first at 800m, first on turn Tempo Suited front runners Video Comment Jumped on terms then pressed on to lead by 1.25L on settling, led at the 800m, led by 2.5L 2W at the turn, held a handy margin on the turn, tackled at the 300m and faded out of contention thereafter. 13d 13/09/2018 ROCKHAMPTON: Margin 2.4 Distance 1400m SOT G RST CL2 Race Bill Reid Racing Hcp (C2) Prize $14,000 API 0.78 Race Time 1:23.79 Time Adj +2.56 Sec Time 0:33.92 Sec Time Adj +0.53 Jockey Nathan Thomas Weight 54.0 CD 54.0 BP 1 Odds 15-4 7-2 - 6-1 Trainer Krystle Johnston OHR: 51 Ongoing Winners [o] 00-01-06 Rail True. Track Direction Clockwise Winner All Eez (60.5) Second Static Lift (61.5) Third Kulaba (55) Inrunning Position first on settling, first at 800m, second on turn Tempo Suited front runners Video Comment Fast into stride and pressed on, led by 3/4L on settling, led by 3/4L at the turn, tackled at the 250m and battled away. 8d 31/08/2018 MACKAY: Margin 0.1 Distance 1560m SOT G RST CL3 Race Ziggys Engineering Plate (C3) Prize $14,000 API 0.43 Race Time 1:34.50 Time Adj +2.58 Sec Time 0:35.63 Sec Time Adj +1.65 Jockey Brad Pengelly Weight 55.5 CD 55.5 BP 3 Odds 4-1 - 5-1 Trainer Krystle Johnston OHR: 52 Ongoing Winners [o] 03-00-10 Rail True Entire Course. (Pent: 4.5). Track Direction Clockwise Winner Casta (59) Third Hyper Drive (55) Inrunning Position first on settling, first at 1200m, first at 800m, first on turn Tempo Suited front runners Video Comment Jumped on terms then pushed forward, led by 1.5L on settling, held position 2L at the turn, kicked clear at top of the straight, pipped on the post. 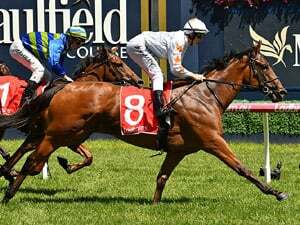 7d 22/03/2019 BOWEN: Margin 2.6 Distance 1000m SOT G RST RST55 Race Industry Fire/First Aid Hcp-55 Prize $16,500 API 0.18 Race Time 0:58.49 Time Adj +2.39 Jockey Wanderson D'avila Weight 57.0 CD 57.0 BP 10 Odds 11-1 - 12-1 Trainer W E Winters OHR: 49 Ongoing Winners [o] 03-04-21 Rail True Entire Course. Track Direction Clockwise Stewards Slightly inconvenienced approaching the winning post. Winner Kap It Off (54) Second Mr Sonador (56.5) Third Lady Mirabella (54) Inrunning Position seventh on settling, sixth on turn Video Comment Jumped on terms, settled midfield 2WWC 5L, 4WNC midfield 5L at the turn, slightly inconvenienced approaching the winning post. 13d 29/11/2018 MACKAY: Margin 8.5 Distance 1200m SOT G RST CL2 Race Triple M Mackay Plate (C2) Prize $16,500 API 3.42 Race Time 1:11.03 Time Adj +2.53 Sec Time 0:34.68 Sec Time Adj +1.16 Jockey Emma Bell Weight 59.0 CD 56.0 BP 8 Odds 11-1 - 14-1 Trainer W E Winters OHR: 51 Ongoing Winners [o] 01-03-10 Rail Out 3m Entire. (Pent: 4.5). Track Direction Clockwise Winner Jayaqua (57) Second Shadea Lady (55.5) Third Justalad (59) Inrunning Position ninth on settling, ninth at 800m, ninth on turn Tempo Suited front runners Video Comment Jumped fairly, settled joint last of 9 2WWC 5L, joint last 2WWC 5L at the turn, passed a couple but was never close. 10d 16/11/2018 MACKAY: Margin 2.5 Distance 1100m SOT G RST CL2 Race Natural Body & Beauty Hcp (C2) Prize $19,000 Race Time 1:04.65 Time Adj +2.55 Sec Time 0:35.29 Sec Time Adj +1.95 Jockey Rhiannon Payne Weight 57.0 CD 57.0 BP 9 Odds 4-1 5-1 - 4-1 Trainer W E Winters OHR: 54 Ongoing Winners [o] 01-03-08 Rail 3m Entire Course. (Pent: 4.55). Track Direction Clockwise Stewards Disappointed for a run between Donavia and Zloto inside the final 100m and was unable to be fully tested. Winner Prince Of Mine (54) Second Magic Word (59) Third Trerice (57) Inrunning Position eighth on settling, eighth at 800m, eighth on turn Tempo No bias Video Comment Jumped fairly, settled 2nd last of 9th 4WNC 5.25L, held position 2WWC 6+L at the turn, disappointed for a run between runners inside the final 100m and was unable to be fully tested. 12d 7/03/2019 ROCKHAMPTON: Margin 5.2 Distance 1300m SOT G RST CL2 Race Tropical Auto Group Plate (C2) Prize $19,000 API 1.9 Race Time 1:16.62 Time Adj +1.91 Sec Time 0:34.15 Sec Time Adj +0.77 Jockey Thomas Doyle Weight 57.0 CD 54.0 BP 3 Odds 8-1 - 20-1 Trainer Peter Fleming OHR: 54 Ongoing Winners [o] 02-02-10 Rail Out 6m Entire Course. Track Direction Clockwise Stewards Began awkwardly. Near the 500m, laid out and bumped Delcetto Syrah. Winner Daunting Queen (55.5) Second Van Winkel (57) Third Shenron (56.5) Inrunning Position third on settling, third at 800m, fifth on turn Tempo Suited front runners Video Comment Began awkwardly, settled on-pace on the inside by half a length, laid out and bumped another runner near the 500m, inside midfield 2L at the turn. 3m23d 23/02/2019 MACKAY: Margin 7.5 Distance 1050m SOT G RST CL2 Race Kombi Keg Whitsunday Plate-C2 Prize $19,000 API 0.13 Race Time 1:01.85 Time Adj +2.21 Sec Time 0:34.11 Sec Time Adj +0.79 Jockey Christopher Mc Iver Weight 57.0 CD 57.0 BP 8 Odds 5-1 - 10-1 Trainer Peter Fleming OHR: 55 Ongoing Winners [o] 01-03-10 Rail Out 4m Entire Course. (Pent: 4.7). Track Direction Clockwise Gear Change Blinkers OFF FIRST TIME Winner Cosmological (59) Second Grazie Mille Bella (55.5) Third Nadeem Esprit (57.5) Inrunning Position sixth on settling, sixth at 800m, eighth on turn Tempo Suited front runners Video Comment Jumped fairly, settled 6th of 8 2WWC 4L, last 3WWC 6+L at the turn. 19d 2/11/2018 MOREE: Margin 9.3 Distance 1300m SOT G RST FM CL2 Race Jolly Swagman Hcp (C2) Prize $22,000 Race Time 1:16.88 Time Adj +1.95 Sec Time 0:35.24 Sec Time Adj +1.46 Jockey Leanne Henry Weight 58.0 CD 58.0 BP 2 Odds 7-2 13-2 - 6-1 Trainer Mark Mason OHR: 55 Ongoing Winners [o] 00-01-10 Rail True. Track Direction Clockwise Winner Ready To Go Go (56.5) Second Shiver Me Timbers (56.5) Third Fudgewedge (59) Inrunning Position fifth on settling, fifth at 800m, seventh on turn Tempo No bias Video Comment Jumped on terms, settled 5th of 8 2WWC 3L, 7th at the turn on the inside 2.25L, no impression in straight. 6d 14/10/2018 ARMIDALE: Margin 2.5 Distance 1400m SOT S RST CL2 Race Bring On The Rain Guyra (C2) Prize $30,000 API 5.8 Race Time 1:25.04 Time Adj +0.64 Jockey Leanne Henry Weight 55.0 CD 55.0 BP 1 Odds 7-2 3-1 - 7-2 Trainer Mark Mason OHR: 55 Ongoing Winners [o] 01-03-11 Rail True. Track Direction Clockwise Gear Change Blinkers FIRST TIME Winner Onya Rosie (54) Second Anghiari (54) Inrunning Position sixth on settling, sixth at 800m, third on turn Video Comment Jumped on terms, settled midfield 3.75L on inside, on-pace 1L at the turn, angled outwards passing the 200m to obtain clear running, boxed on steadily to the line. 14d 13/12/2018 MACKAY: Margin 4.5 Distance 1560m SOT H RST CL2 Race Jetson Salvage/Scrap Metal-C2 Prize $19,000 Race Time 1:35.04 Time Adj +0.54 Sec Time 0:36.28 Sec Time Adj +0.28 Jockey Rhiannon Payne Weight 59.0 CD 59.0 BP 4 Odds 13-2 - 9-1 Trainer G D Fisher OHR: 51 Ongoing Winners [o] 01-03-07 Rail True Entire Course. (Pent: 5.85). Track Direction Clockwise Winner Shiranda (56) Second Trerice (57.5) Third Donavia (59) Inrunning Position ninth on settling, ninth at 1200m, ninth at 800m, seventh on turn Tempo No bias Video Comment Jumped on terms then eased back, settled last of 9 on the inside 6+L, 7th on the inside 3L at the turn, passed a few late without threatening. 9d 29/11/2018 MACKAY: Margin 2.9 Distance 1200m SOT G RST CL2 Race Triple M Mackay Plate (C2) Prize $16,500 API 3.42 Race Time 1:11.03 Time Adj +2.53 Sec Time 0:34.68 Sec Time Adj +1.16 Jockey Rhiannon Payne Weight 59.0 CD 59.0 BP 5 Odds 15-2 - 12-1 Trainer G D Fisher OHR: 53 Ongoing Winners [o] 01-03-10 Rail Out 3m Entire. (Pent: 4.5). Track Direction Clockwise Winner Jayaqua (57) Second Shadea Lady (55.5) Inrunning Position seventh on settling, seventh at 800m, fifth on turn Tempo Suited front runners Video Comment Jumped on terms then eased back, settled 7th of 9 2WWC 3L, 5th 3WWC 3L at the turn, chased well closing the gap on the winner late in the race. 11d 20/11/2018 ROCKHAMPTON: Margin 5.3 Distance 1100m SOT G RST BM55 Race Milner Constructions (BM55) Prize $16,500 API 1.14 Race Time 1:03.62 Time Adj +1.92 Sec Time 0:33.80 Sec Time Adj +0.74 Jockey Rhiannon Payne Weight 58.0 CD 58.0 BP 11 Odds 20-1 - 14-1 Trainer G D Fisher OHR: 53 Ongoing Winners [o] 03-02-11 Rail Out 5m Entire. Track Direction Clockwise Stewards Held up for clear running between the 600m and 400m. Winner Mr Phenomenal (57.5) Second Killer Love (55.5) Third Worth The Time (55) Inrunning Position ninth on settling, ninth at 800m, eighth on turn Tempo Suited front runners Video Comment Jumped fairly, settled worse than midfield 3WWC 6L, held up for clear running between the 600m and 400m, 2WWC worse than midfield 6+L at the turn, kept battling on making minor ground but never likely. 15d 9/11/2018 ROCKHAMPTON: Margin 7.0 Distance 1300m SOT G RST BM65 Race Xxxx Gold (BM65) Prize $19,000 API 0.72 Race Time 1:16.95 Time Adj +2.25 Sec Time 0:34.27 Sec Time Adj +0.88 Jockey Michael Stephens Weight 54.0 CD 54.0 BP 8 Odds 11-1 - 15-1 Trainer G D Fisher OHR: 53 Ongoing Winners [o] 01-02-15 Rail True. Track Direction Clockwise Stewards Began awkwardly and shifted out near the 900m. Winner Jay Jay (57) Second No Effort Needed (57.5) Third Durif (62.5) Inrunning Position ninth on settling, ninth at 800m, sixth on turn Tempo Suited front runners Video Comment Began awkwardly, settled last on the inside 6+L, shifted out near the 900m, 3WWC worse than midfield 3L at the turn, just held position in the straight. 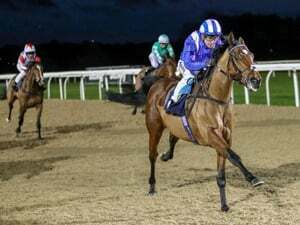 28d 12/02/2019 MACKAY: Margin 4.2 Distance 1050m SOT G RST CL3 Race Mcdonald Murphy Machinery (C3) Prize $19,000 API 1.2 Race Time 1:02.26 Time Adj +2.62 Sec Time 0:34.91 Sec Time Adj +1.59 Jockey Wanderson D'avila Weight 54.0 CD 54.0 BP 2 Odds 50-1 - 80-1 Trainer Joao M Campeao OHR: 47 Ongoing Winners [o] 02-05-13 Rail Out 4m Entire. (Pent: 4.8). Track Direction Clockwise Winner Liker (54) Second The Cheetah (60.5) Third Grazie Mille Bella (51.5) Inrunning Position second on settling, second at 800m, second on turn Tempo Suited front runners Video Comment Began well, settled 2nd of 7 on the inside by half a length, 2nd 3WNC 1.5L at the turn. 12d 15/01/2019 MACKAY: Margin 6.2 Distance 1300m SOT G RST BM55 Race Mcdonald Murphy Machinery-Bm55 Prize $16,500 Race Time 1:17.47 Time Adj +2.67 Sec Time 0:35.06 Sec Time Adj +1.39 Jockey Ms C Jokic Weight 54.5 CD 54.5 BP 6 Odds 30-1 - 50-1 Trainer Joao M Campeao OHR: 47 Ongoing Winners [o] 01-03-09 Rail True Entire Course. (Pent: 4.8). Track Direction Clockwise Winner Trerice (61) Second Shoneck Affair (56.5) Third Aussie Tycoon (54) Inrunning Position third on settling, third at 800m, fourth on turn Tempo Suited front runners Video Comment Jumped on terms, settled 3rd 9 2WNC 3/4L, 3rd at 800m, 4th 3WWC 2.5L at the turn under pressure, made ground from upon straightening until the furlong, run ended there and only battled home.